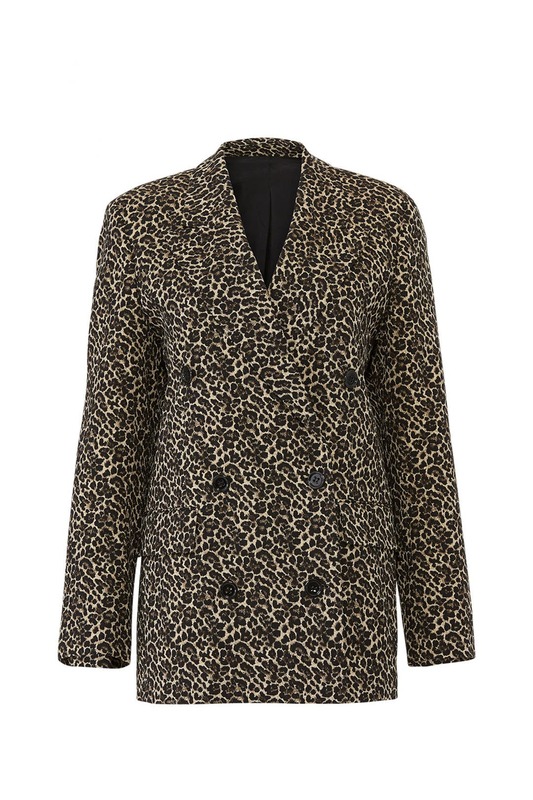 Trend-right leopard offers a wild update to this double-breasted blazer by The Kooples. Style with the Dolly O-Ring Bucket Bag by Loeffler Randall. Leopard jacquard-weave (60% Cotton, 28% Polyamide, 9% Polyester, 3% Elastane). Blazer. Long sleeves. Exposed front button closures. Pockets. Fully lined. 28" from shoulder to hemline. Imported. So cute but a little stiff. This blazer is so beautiful. I was so excited to wear it but it was just so big. I'm a size 6-8 and I ordered size 1 but it was so large. Sadly I could not wear. 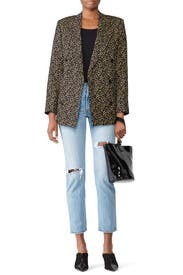 Great slightly oversized blazer with some sass. Will definitely rent again. The fit is huge and the fabric is sparkly (which I couldn't tell from the photos). I ended up not wearing it. 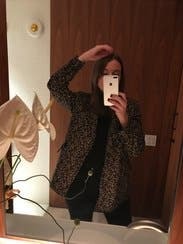 Cute blazer - would definitely recommend. Sleeve length was perfect. Blazer didn't look great buttoned; it made me look lumpy. I wore it open and liked the way it looked. Great length, also! wore this one a few times..the shoulder pads made it very boxy but otherwise the fit was perfect. very soft and comfy. would definitely wear again. Really cool and exactly what it looks like on the site, but ultimately was a little too trendy for me. Beautiful jacket with a brilliant shine to the texture. I loved the comfortable fit. Nice pockets as well. I am obsessed!!!!! This is the best casual Friday look ever I love this blazer. It's a little big but the oversized look is in! I would like live in this blazer! It was so fun; I wore it to work and received so many compliments from colleagues and clients. It does run big; but I didn't even care. I felt like an absolute boss babe. Loved this edgy look. I took off one star because some of the metallic threads would come through the arm lining and poke me occasionally. But overall I'm glad I rented it! Loved the compliments I got for wearing this. It is funky but a little big and boxy. This coat was fab. Would rent again. Looked great with a tee or a formal cami. Runs slightly large but I liked the loose fit. I'm so disappointed by this blazer because it is so sparkly. It fits perfectly (I'm normally a 6 and the 1 fits me TTS) but it's so sparkly it almost looks like a costume. I rented this for work and there's no way I could wear this in a professional setting. Other reviews mentioned a little sparkle but I had no idea how much. I wish I had a fun party or event to wear this to, but sadly I'll be returning without wearing. Only thing to improve this blazer would be real pockets. It does have one inside pocket, and was a little shinier than I was expecting, but still perfect for work and an after-work thing. Felt very put together all day. I wore this to a costume party and it was great. The shoulders are padded and the fit is a little boxy. i really loved the fabric and pattern of this blazer. however, this fit was too boxy/large for my personal taste and style. 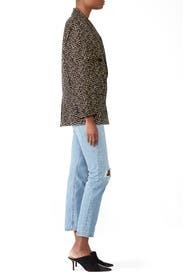 i could totally see someone else pull this off with some cute skinny jeans. give it a try. Was way too big and was swimming in it. I'm petite as well and feel it would look better on someone much taller. Great way to mix up you wardrobe for the week. Runs big. Does run big... think I would've been happier going a side down. Even though I typically like my blazers a little bigger. Super cute, but runs very large and is metallic! 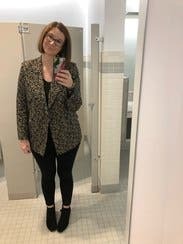 I rented this blazer as a cute but professional option to wear to work. Unfortunately, it didn't work out for me for two reasons. (1) It's not clear from the picture or description (unless I missed something), but this blazer is metallic, with gold thread. It will be absolutely adorable for the holiday party season, but was definitely NOT appropriate for my office. 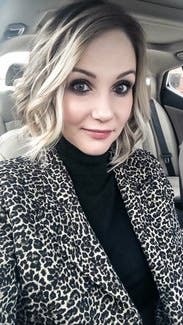 So if you're like me and in a workplace that can handle animal print but maybe not sparkly animal print, skip this one. (2) It runs very boxy and a bit large, so size down if you're between sizes FOR SURE. 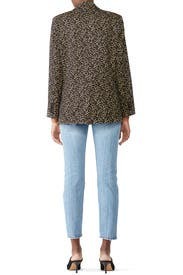 It may also be more flattering on taller girls -- it was quite long on me, and I'm 5'5. Otherwise, this jacket is super cute and looks to be high quality. I can definitely picture a different body type looking amazing in it at a trendier work place, for everyday, and DEFINITELY over black for a party. Way too big. Sizing way off! 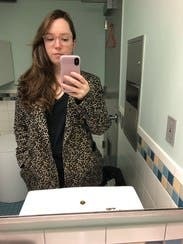 I thought this would be a fun blazer to wear to work. It is very boxy and very large. I have petite shoulders, but was majorly swimming in it. It was more sparkly than I expected, but that wasn't a big deal. This sizing was way off! I liked the fabric on this but the sizing was off for me. This is just okay. I wore it once. Perhaps just too aggressive for my style. Love the fit. Great with slacks or skirt. Nice causal fabric. I'd rent it again for everyday. Fun fabric. Great blazer and easy way to try the animal print trend - this runs true to size, I usually wear a 4/6. Note that there is not much stretch at all so if you have broad shoulders are a more muscular build, a size up would be more comfortable. I didn't love this. It is sparkly in real life and the cut is more boxy than it appeared in the photo.